Dennis Crowley, founder of DodgeBall, a hipster SMS-social networking service that Google bought back in May 2005 has quit Google, reports Young Manhattanite. 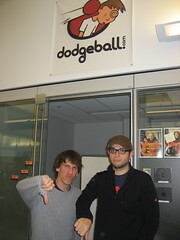 Alex Rainert, employee #2 for DodgeBall has also left the company. They both resigned on April 13th, 2007. DodgeBall suffered from apathy and not much happened with the service that once was a coast-to-coast rage. DodgeBall has been replaced by Twitter and Jaiku, the new shiny things amongst those who love such services. Here is their announcement on Flickr! Like DodgeBall, Blogger team members and dMarc founders left GooglePlex, preferring to follow their own internal algorithm instead of working for Google. It seems like a trend: for entrepreneurs who sellout to Google, Google money is good, but working for Google, not so good! “coast to coast rage”? That service had a couple thousand people max. Google is into successful stuff, not press hype. I can’t help but wonder what this says about G’s acquistion strategies- it seems to me like Google is not interested in buying any sort of idea/work structure, but just raw market share and then incorporating it into their own models. Flickr stagnating? Huh?! You’ve clearly not been paying attention. i didn’t realize dodgeball was ever a success beyond being acquired. can i get a check in? Okay, so they were unhappy. Is this the way to announce it, though? The business world is small, tech is even smaller. Just seems more short-sighted. Keep such things private, if that’s even possible anymore. Is this any different for any entrepreneur bought by a larger company. YouTube is imploding, Flickr is stagnating, delicious is losing ground to magnolia etc. Once you’ve taken the money and gone inside the corporate towers, it is often the lack of nimbleness that frustrates the entrepreneurs. The best option is bank the money, serve out your notice period and go do it again. :D Must not have had my GigaTranslator glasses on correctly. Everything seems to be reading properly now. Also: it’s interesting that they used Flickr as their tool of departure notification to the rest of the world, rather than some other means (blogs, twitter, press release, video, etc.). Working for Google, good for most. Startup entrepreneurs working for Google (or whoever becomes their overlords), not so good. I mean, look how many happy employees there are at Google?